The defending Super Bowl Champions come into the 2017 season as clear-cut favorites for a repeat. Tom Brady did turn 40 early in training camp but don’t expect any slowing down from likely the greatest quarterback ever. Even with the recent season ending injury to Julian Edelman (ACL) there are still plenty of weapons for Brady to choose from. Danny Amendola will have to produce more than usual to pick up for the absence of Edelman in the slot and look for Dion Lewis and Rex Burkhead to help that out of the backfield as well. Speed demon Brandin Crooks gives Brady the downfield threat he hasn’t had since Randy Moss, and that line will keep him upright. The running game will suffer a bit without LeGarrette Blunt and hopefully Rob Gronkowski can stay healthy but all in all the offense is too strong. 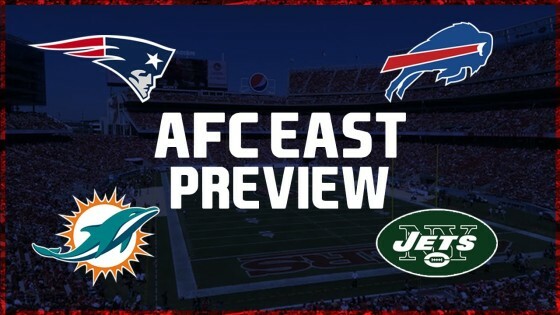 Dont’a Hightower and Patrick Chung will once again lead the defense up the middle, and free agent Stephon Gilmore is a top end cornerback who never got the media attention in Buffalo. I won’t give any team a 16-0 prediction, especially considering the Patriots have done it before under Brady. This team is going to be difficult to beat however and expect another Super Bowl Title this year in what could be Brady’s last season. I have thought for a few years now that the Buffalo Bills would finally break through, but they are what they are and what they are is a team around .500. Tyrod Taylor is a little better than average and certainly a professional player, but he simply is not capable of carrying an average team all the way to the playoffs. With his impending free agency as well I would expect rookie Nathan Peterman to get action late in the season, especially when Buffalo is eliminated. LeSean McCoy is the only playmaker on offense after the Sammy Watkins trade. Watkins is a solid player but can’t stay healthy enough and so the passing game won’t suffer too much but it won’t be that good as is. The offensive line is not terrible but the offense is only a little above average and look for Buffalo to lose a lot of close games this season when the other offense is making plays the Bills offense will not. I really like this teams defensive line with a healthy Shaq Lawson and Jerry Hughes rushing the passer. Marcell Dareus is one of many underrated defensive tackles in this league who plays on an average team that doesn’t get the publicity he should. The team’s secondary is going to be a problem after seeing Stephon Gilmore head to division rival New England and the training camp trade of Ronald Darby. A lot is going to be put on first round pick Tre’Davious White and cornerback for this team to have any shot at a playoff berth. Unless this team plays flawless football all season long and finally finds a way to win the close games, expect another year this team is not in the postseason, where they haven’t been this century. The offseason saw a likely season ending knee injury to quarterback Ryan Tannehill and subsequent signing of Jay Cutler out of retirement. I have never been the biggest Tannehill fan, but I haven’t been the biggest fan of Cutler either. Jay Cutler has gotten a bad rap for some things that weren’t his fault in Chicago (though a lot of it was) such as the offensive line play. The Dolphins are actually pretty solid on the line with recent first round tackle picks Ja’Wuan James and Laremy Tunsil. Mike Pouncey is also very good at center and that may allow this team to catch lightning in a bottle with Cutler being protected, as well as playing in coach Adam Gase’s system. Wide receivers like Jarvis Landry, Kenny Stills, and DaVonte Parker give Cutler the weapons needed. Jay Ajayi is a very productive back and expect that to continue as well. The Dolphins have attempted to improve their defense by drafting defensive lineman/outside rush linebacker Charles Harris in the first round and adding veteran linebacker Rey Maualuga. Dolphins were a playoff team last year and I liked the way Gase changed the culture of this team, but I don’t see Jay Cutler cutting it this year. There is potential this could be a one hit wonder for him though. Just as I won’t pick a team to go 16-0, I won’t pick a team to go 0-16, but the Jets just might do it. This team is not trying to win and has completely lost it’s way. I wrote an article at the end of last season discussing Todd Bowles and how the 2015 season was the worst thing that could have happened to this team. Everything went right for the Jets that year and they just weren’t that good, and after last year an impatient fan base and ownership now have this team in disarray. Bowles probably won’t last the season and this team probably isn’t even trying to win, hoping to get the top overall pick. There are no answes at quarterback wherever you look at the only offensive weapon wide receiver Quincy Enunwa was lost for the season. 38 year-old journayman Josh McCown will be the one in front of the firing squad at quarterback, and I don’t think either Christian Hackenberg or Bryce Petty are the future at quarterback. Not because I don’t think there is potential between those two, but there doesn’t seem to be anything else but tanking going on for the Jets. This offense will be horrible all year long and a good coach in Todd Bowles will pay the price for it. Rich Van Tassel - who has written 47 posts on Write On New Jersey.